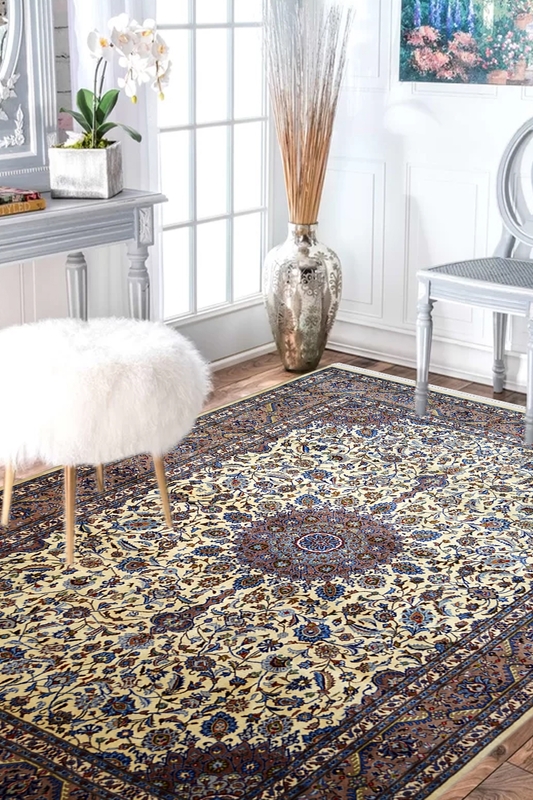 Mix and match your living style with this ethnic style of wool area rug which contains bold motifs in blue and gray color on the ivory ground. This is highly durable and hand- washable rug. Smooth and soft, the Ivory Pradhan wool area rug reflects the intricacy of the design and hand craftsmanship of weavers. Ideal for the fashion-forward decorator who is looking for an oriental and ethnic look in floor coverings, Ivory Pradhan wool area rug delivers artful sophistication in a choice of patterned and classy designs. It contains Kashan design pattern with the combination of Ivory and blue color. This design has been originated from Persia in the 19th century.